Jesus’ world was far more religiously pluralistic than most of us imagine. He grew up and headquartered His ministry in “Galilee of the Gentiles.” He regularly rubbed shoulders with polytheistic and superstitious Romans, with philosophical and sophisticated Greeks, with hard-partying pagans, and with God-fearing Africans. The Bible tells us that Jesus, unlike His fellow countrymen, did not avoid the despised and syncretistic Samaritans. Nor did Jesus shun the Jews who were considered persona non grata in the local synagogues, like those who worked for the occupying government, or who rejected Hebrew ways in favor of Greek, or who lived hellion lifestyles. Moreover, Jesus interacted with individuals representing all of the major sects of Judaism – Sadducees, Pharisees, Zealots, and Essenes. And these included a huge variety of spiritual expression from the emotional to the contemplative, from the spontaneous to the staid, from Bible-thumpers to compassion-lovers, from those who push religion to the four corners of their lives while others passionately seek to push it to the four corners of the globe. Is there some way to categorize, organize, and understand the varieties of spiritual expression that Jesus encountered? Is it possible that the kinds of people Jesus dealt with in His day are similar to the ones we face today? Are there prototypical and stereotypical religious patterns to which people gravitate? And why do we do so? If we lived in Jesus’ day, what spiritual “camp” would be most like ours? How would Jesus approach us? What would he do with us? 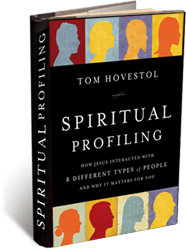 What would our Spiritual Profile be?